Somewhere around Ollantaytambo the Vilccanota river changes names to Urubamba. The railroad from Cuzco to Machu Pichu follows the river and the milage posts are used to reference location. The best way to run the radical upper stretch is to take the local bus from Cuzco to Aguas Calientes and sit at a window on the left side of the train. All it is slow you need to take the local train in order to haul your boat. If the baggage car is full you will need to do what we did and tie your boats on the roof of the train. There is no road along this stretch only the railroad so it is important to note the stops the train makes, the km post of the stops so you will have an idea of what section you are heading into as you head downriver. On our trip in August of 1993 we spent the night in Aguas Calientes (trainstop for Machu Pichu). The next morning we got on the local train going back to Cuzco and got off at our chosen put in of Chilca (km 76.8, elevation 2760 meters). The 7 km section of river above between Ollantaytambo and Chilca is flat and we chose to avoid it. The day we ran this stretch it was snowing and the river was high from a recent (unusual) storm that had dumped over a meter of snow in mountains. The river was running around 1500 CFS and was brown and pushy. At lower flows all rapids would be at least half a grade lower than when we ran it. From Chilca to km 82 it was class 4+ and 5 with one 5+ rapid. From km 82 to 88 there were 3 portages. Just below km 82 was a backed up river wide hole. 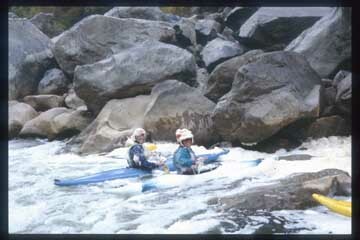 The next portage was a rapid full of fang rocks and no sneak. The 3rd portage was at km 87 with a class 6 gorge. It is easiest to portage this one by hiking up to the railroad tracks than it is to try to move along the river. The boats can be pulled easily if they are put perpendicular on the tracks. The portage goes through a tunnel and the remaining 1 km of boating on the other side of the tunnel is good class 4+, 5-. At this point one can return to Aguas from the trainstop at km 88 called Qoriwayrachina (elevation 2480). On our trip, we were able to catch the same train which we took up in the morning as it was returning from Cuzco. We arrived at 4:20 PM and the train came by shortly after at. Km 88 is the most popular starting point for the Inca trail so there is usually someone around. The train from KM 88 to Aguas Calientes may make two additional stops along the way. Pampa Cahua: km 92 Cedro Bamba: km 101 If you elect to run from km 88 to Aguas it should be self supported as there is no where to buy food or sleep along this stretch of river. An option is to run everything as day trips returning each night to Aguas Calientes (elevation 2000 meters) where there are hot springs, hostals, and restaurants. A few km above the town of agues there is a dam on the river needs to be portaged along the tracks. Alongside and below the town of Aguas itself is an ultra radical stretch of river whose flow is affected by the water diversions. Here also begins a 23 KM stretch of river to the town of Santa Teresa that drops 400 meters. We were told a Japanese stuntman lasted about 2 minutes while attempting a run a medium flows. From Santa Teresa (1600 meters elevation) to Quillabamba (1000 meters elevation) is a 44 km strech of river that drops 600 meters.